France's Nacer Bouhanni won the 174.4km second stage of the Vuelta a Espana in a sprint finish, as Briton Chris Froome remained 27 seconds off the lead. 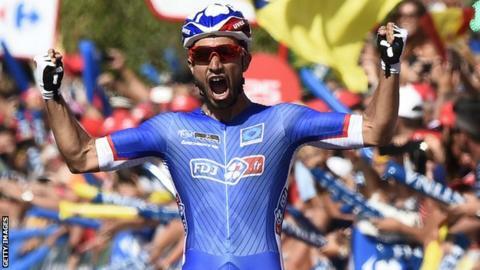 Bouhanni, riding for FDJ, edged clear of German John Degenkolb and Italy's Roberto Ferrari. Movistar's Alejandro Valverde, who won this race in 2009, is in the overall lead after Sunday's flat stage. Team-mate and race favourite Nairo Quintana is second after he finished in the peloton alongside Froome. All the time gaps among the contenders remained the same. The usual early break on Sunday's race from Algeciras to San Fernando was a six-man group. Nathan Haas of Garmin-Sharp, who had a poor team time trial, was first over the only categorised climb of the day to take the early king of the mountains jersey. The main teams made their presence felt at the front of the peloton, Movistar and Sky taking turns as they sought to keep their men safe on some tight corners in strong winds. The sprinters moved into prominent positions with 20km to go, and Bouhanni made it over the line first with Degenkolb close behind.